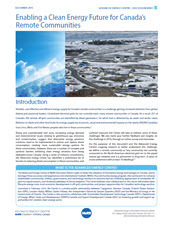 Reliable, cost-effective and efficient clean energy supply for Canada’s remote communities is a challenge gaining increased attention from global, federal and provincial leaders. Centralized electrical grids do not currently reach many remote communities in Canada. As a result, 257 of Canada’s 292 remote off-grid communities are electrified by diesel generators1, for which fuel is delivered by air, water and winter roads. Reliance on diesel and other fossil fuels for energy supply has economic, social and environmental impacts on the nearly 200,000 Canadian, Inuit, Innu, Metis and First Nation peoples who live in these communities. barriers to reducing diesel consumption in these communities, and outlined measures the Centre will take to address some of these challenges. We also invite your further feedback and insights on this challenge in 2016, through an online survey and interviews.